On Sunday morning we went to the airport and caught our flight to Hawaii. The first leg of our trip took 5 hours. We thought we were going to have a ten hour layover in Hawaii, but we had read the ticket wrong. In no time at all we had boarded the airplane for the ten hour leg of our trip. 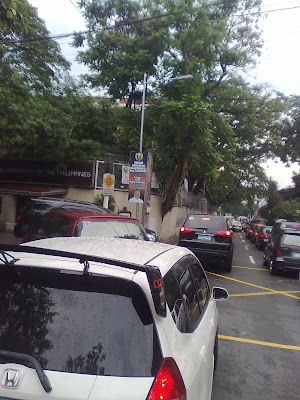 When we arrived in Manila we found that the traffic was just the way we had left it. The next morning we went to the school to register Thomas and Carrie. On Wednesday afternoon, while we were at the school, a storm passed through and dumped buckets of water on the area. When we tried to go home we found that the roads were flooded. I accidently drove into a deep spot and that was a big mistake. Water got sucked into the engine and the van died right then and there. This picture shows the spot where our van died. That is not our van. When our van was there the water was a foot deeper. As we sat there in the lake wondering what to do, the water kept rising and was coming into the van and covering the floor. We decided to jump out the windows and see if we could push the van out of the flood. Praise the Lord, Thomas, Carrie, and I were able to push the van to high ground. Unfortunately, the water in the engine caused a rod to bend and the mechanic says he will need a week to fix it. We had to leave our van on the road that night. 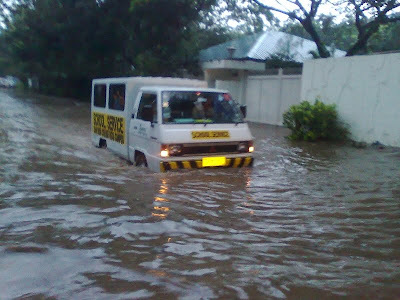 We had been enroute to our guest house but were blocked by the flood, so someone gave us a ride to our house. The electricity was out, but we had a loaf of bread and peanut butter that we could have for dinner and we found some candles and dug into our crates to find bedding and clothing. We were about ready to call it a day when some friends called and said that the water was probably low enough and they were going to go to the mission home in their van. 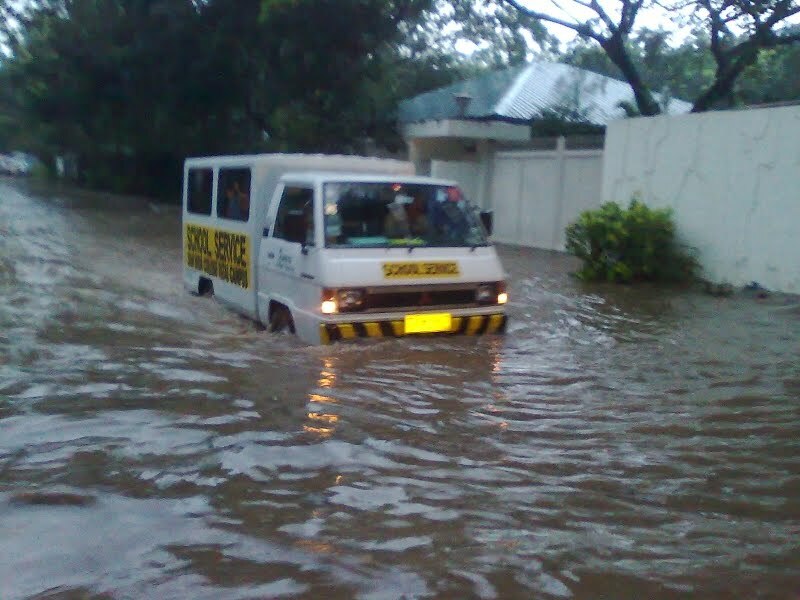 We decided to go along, not knowing that the traffic on the streets had become gridlocked due to the rain storm. The trip that can be made in 30 minute when there is no traffic took more than 4 hours. We got the kids to bed just after midnight. They had to be up to start their first day of school 4 hours later. As soon as the kids started school, Heidi and I spent our time working on getting ready for the Northern Luzon conference which was beginning the following day. Many folks played roles in getting the conference off to a good start. Our main responsibility was getting the child care program set up. Heidi had lots of activities planned and Ginny Olsen came alongside her and made sure the program ran smoothly. We were amazed at how many families we have who are assigned or will potentially be assigned to Northern Luzon. These kids represent a big answer to our prayer for more missionaries. The whole group enjoyed singing, Bible stores, crafts, games, and snacks. We enjoyed getting to know them. We are very thankful that the conference went very well. The teaching was encouraging and helpful. The fellowship was wonderful. Hopefully our missionaries will return to their assignments encouraged to serve the Lord. Never a dull moment for your family! :-) Glad you all made it safely home and survived the first crazy week back. We felt very homesick seeing the pictures from conference with some dear friends (and kids) that we are missing, but we know that it was a good time for everyone. And that you guys were a huge blessing for taking care of all the kids!